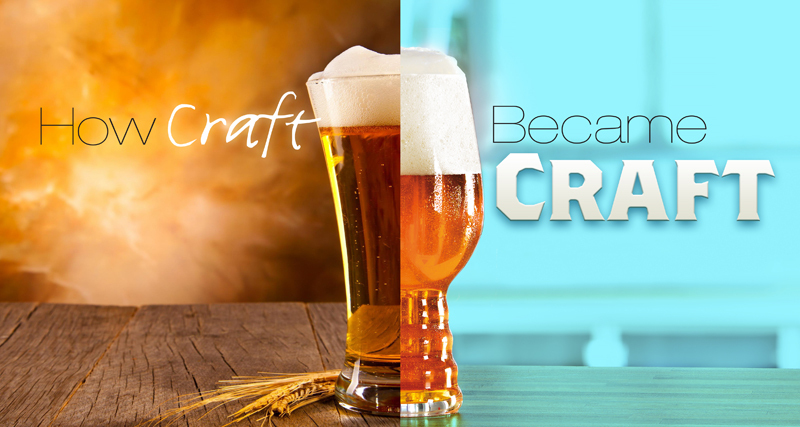 Some call the word “craft” beer a perfect choice, and others consider it meaningless. Tracing its etymology reveals how craft beer got to to where it is today. When All About Beer Magazine was launched in 1979, nobody talked, wrote or maybe even dreamt about something called craft beer. Five years later Vince Cottone, a beer columnist for the Seattle Post-Intelligencer who contributed to numerous publications, first used the phrases craft-brewing scene, craft brewery and craft brewing in the manner they are thought of today. Readers understood what he meant, but craft beer didn’t become part of their vocabulary all at once. The New York Times didn’t bother with it until 1997, and then only occasionally. There were only a handful of what Cottone called craft breweries in 1984, but as thousands more followed, the name stuck. Each of them is a little bit different. Annual sales of craft beer swelled from less than 72,000 barrels (2.2 million gallons) in 1984 to 20 million barrels in 2014, and estimates are the number of consumers who drink craft beer has grown to 40 million. Each of them is also a little bit different, and, if they think about it at all, their ideas of what craft brewery and craft beer mean are different as well. The words craft beer are part of dozens of book titles and several magazine names; it seems every city has a craft beer week; many breweries have made it part of their names; there is a chain of stores called Craft Beer Cellar; the “I am a craft brewer” video has been watched uncounted times at various Internet sites; and the Colorado Brewers Guild recently began to promote Colorado as “The State of Craft Beer.” The term has spread to England, Brazil, Japan, Argentina, Italy, Poland, Germany, China and likely three other countries since you began reading this paragraph. The century-old Palm Breweries in Belgium were recently rebranded as Palm Belgian Craft Brewers. The Global Association of Craft Beer Brewers was founded in 2013, with its own criteria for what qualifies as a craft brewery. Cottone picked the word craft because it “seemed to fit best.” He did not envision that his terminology would work its way so deeply into American beer culture, that craft beer would be used both as a marketing term and an anti-marketing term, or that some would still embrace at least parts of his rather specific definition, and others would find their own entirely different one. Some would call it a perfect choice, and others consider it meaningless. Tracing its etymology reveals how craft beer, certainly the two-word noun and perhaps even the entity, got to where it is today. Cottone did not use the words craft beer in 1984 when he wrote an article headlined “Craft Brewing Comes of Age” for New Brewer magazine, a publication for members of the Institute of Brewing Studies. (The IBS was a subsidiary of the Association of Brewers, which merged with the Brewers Association of America in 2005 to form the Brewers Association [BA].) He also did not include any definitions. Association of Brewers (AOB) founder Charlie Papazian first defined craft brewery in New Brewer in the spring of 1987 as “any brewery using the manual arts and skills of a brewer to create its products.” He then listed the various categories of breweries: brewpub, microbrewery, small brewery (between 15,000 and 100,000 barrels), large brewery (up to a million barrels), and mega or giant brewery (bigger still). Craft brewery and craft beer insinuated themselves into the vocabulary of what would eventually be called the “craft beer industry” during the next 10 years. For instance, what was known as National Microbrewers and Pubbrewers Conference and Trade Show until 1995 became the Craft Brewers Conference in 1996. When the IBS began to aggregate craft brewery production, a concrete definition of what qualifies as a craft brewery was needed. After two years of review, IBS director David Edgar wrote members in the mid-1990s, it was decided that brewers included in the craft statistics would 1) have a federal brewer’s notice, 2) sell beer brewed with no more than 10 percent adjuncts, 3) not use artificial coloring or artificial flavoring, and 4) that no more than one-third of ownership would be by noncraft breweries. Paul Gatza, who succeeded Edgar as IBS director and now is director at the BA, explained the internal criteria were tweaked in the decade that followed. After the merger that formed the BA in 2005, the board of directors approved a definition (see sidebar) that focuses on the words small, independent and traditional, although what constitutes small and traditional has been revised since. It became the definition that people look to first, if only to point out what’s wrong with it. In The Craft Beer Revolution, author Steve Hindy, co-founder of the Brooklyn Brewery, writes that whom an association was going to promote and protect and how to define craft brewer had been contentious issues for years. The definition the board agreed on settled the first matter, but not the second. “The reason for a definition was a pretty pragmatic one,” he says. “It was to define the population of brewers the Brewers Association was representing.” The Widmer Brothers Brewing Co. and Redhook Ale Brewery, both of which had been included among the 50 largest craft breweries on the 2005 list compiled by the BA, were cut from that list in 2006 because they were partly owned by Anheuser-Busch. Goose Island Beer Co. and Blue Point Brewing Co. were later struck from future lists for the same reason. 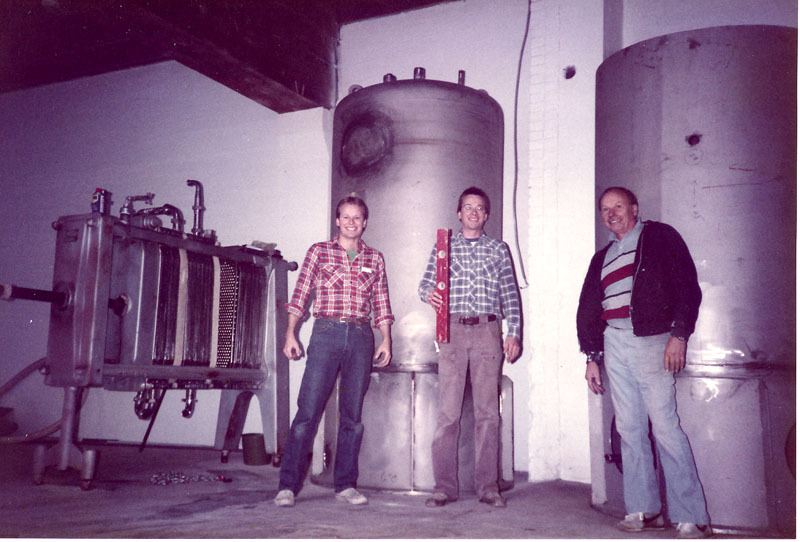 Brothers Kurt and Rob Widmer (pictured with their dad, Ray) founded Widmer Brothers Brewing Co. in 1984. 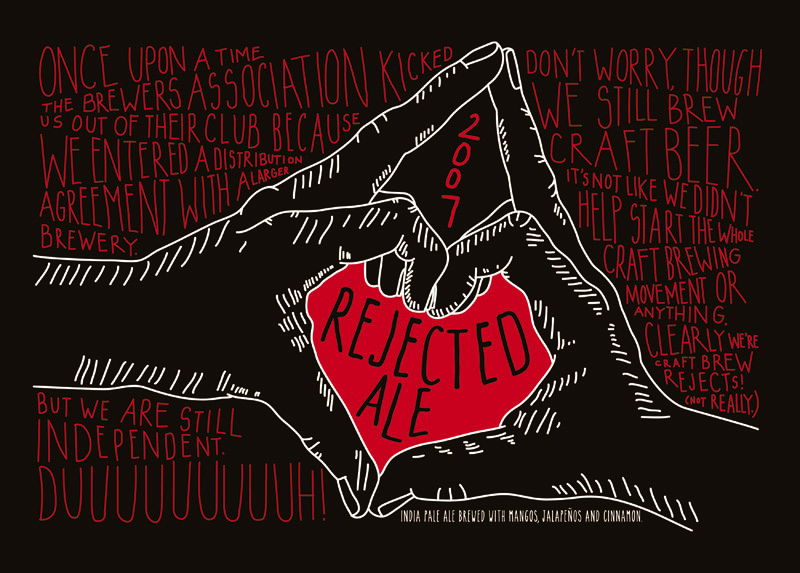 The label for Widmer Brothers Brewing’s Rejected Ale explains why the Brewers Association removed the brewery from its list of craft brewers. Ten years earlier, Fred Eckhardt polled industry members for a column headlined “What is ‘craft beer’?” that appeared in All About Beer at the outset of 1997. It was a topic discussed often by brewers that seldom showed up in print. In fact, in the first of a lengthy two-part interview with Papazian and Michael Jackson about the past and the future of beer—included in the same issue as Eckhardt’s column—the words craft and beer never appeared in tandem. After an early romance with drinkers when the company began selling its beers in the Northwest in 2002, New Belgium Brewing discovered the grass-roots relationship marketing that had worked close to its Colorado base could not be replicated in Oregon and Washington. When sales fell, New Belgium turned to marketing consultants Douglas Holt and Douglas Cameron. They outline and explain the strategy they developed in a chapter called “Fat Tire: Crossing the Cultural Chasm” within their book, Cultural Strategy: Using Innovative Ideologies to Build Breakthrough Brands. New Belgium is one of several breweries Alan McLeod, co-author of The Unbearable Nonsense of Craft Beer—A Rant in Nine Acts, describes as big craft. “What bugs me about ‘craft beer’ as a term is that it arose to cover up that micro beer was less and less crafted and more and more industrialized. It is double speak,” he wrote via email. “… New language was required to mask the industrialization and then nationalization of what is now big craft. Bystanders may be injured in the process. In 2012, the Brewers Association issued a statement that kicked off a “craft versus crafty” debate that continues today. It was intended to draw attention to the “increase in production and promotion of craft-like beers by large, non-craft breweries,” and specifically named Blue Moon Belgian White brewed by MillerCoors and the Shock Top beers made by Anheuser-Busch as craft pretenders. The BA also posted a list of “Domestic Non-Craft Brewers” at Craftbeer.com, the website used to promote its members. The list included August Schell Brewing Co., noting the company was not considered traditional because its beers are made with adjuncts. Jace Marti of August Schell Brewing Co.
Jace Marti—the line under his name on his business reads, “Brewmaster * 6th generation descendent”—posted a passionate letter at the company website and on its Facebook page defending Schell as a traditional brewery and describing the “list of shame” as “rude and quite frankly, embarrassing.” The BA removed the list at Craftbeer.com rather quickly, but the information remained available at craftbeerblacklist.com and on a smartphone app. A frame from the “The Tinkerer,” a 2003 commercial from New Belgium Brewing Co. 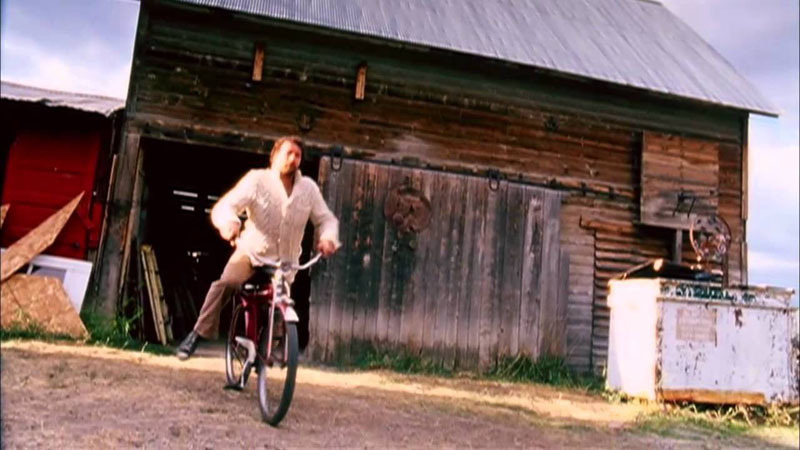 The New Belgium commercial that Holt and Cameron created in 2003 features a character they called The Tinkerer, who finds an old bicycle at a garage sale, carefully restores it and then happily rides it into the Colorado countryside. The final frame features a glass of Fat Tire beer, but more than a decade after the spot appeared, those who saw it most often remember The Tinkerer. Neal Stewart was 28 years old in 2002 and a brand manager for Pabst Brewing Co. when the beer underwent a revival so astonishing that the story ended up on the cover of a New York Times Sunday magazine and was a part of several books studying marketing successes. Pabst sales grew 45 percent from 2002 until 2006, when Stewart left the company. Pabst returned to the headlines in September when the company was sold. Much was made of the fact that the new CEO is Russian by birth, but he grew up in New York and graduated from Columbia University. Nonetheless, questions rose immediately about whether Pabst could continue its hipster cachet. In a study (“What Makes Things Cool: How Autonomy Influences Perceived Coolness”) released in May, two market researchers wrote that there’s a direct correlation between a brand’s perceived autonomy influences and its perceived coolness. Stewart does not need to coach Dogfish Head co-founder Sam Calagione on the subject. “He recognizes the importance of talking about us as an indie brewer every chance he gets,” Stewart says. When Sam and Mariah Calagione opened their production brewery in Delaware in 1997, Sam knew exactly why he wanted to call it Dogfish Head Craft Brewery, making it the first brewery in the country to include craft in its name. In 1995, the same year they started Dogfish Head Brewings & Eats, Miller Brewing had acquired Celis Brewery and Shipyard Brewing, placing them under its American Specialty/Craft Beer Company umbrella. Fifteen years later, the craft versus crafty conversation continues. “If there wasn’t a definition, we’d need (to write) one,” Stewart says. 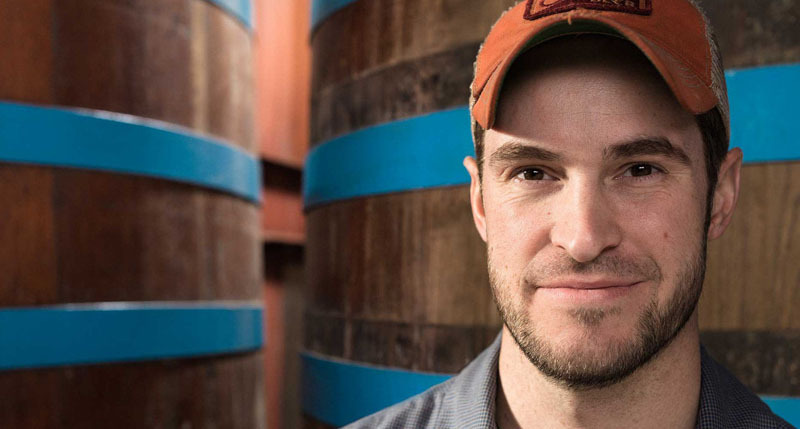 “That keeps the purity of who a craft brewer is.” When consumers tour the Dogfish Head brewery, one of the first things they hear is the Brewers Association definition of craft beer. For the time being, Stone press releases still identify it as a craft brewery. Craft can be a useful word, if not always necessary. This story appears in the March 2015 issue of All About Beer Magazine. A lifelong journalist, Stan Hieronymus has been writing about beer since 1993, beginning after he first met Daniel Bradford at Oldenburg Beer Camp. To the best of his memory the words “craft” and “beer” were not spoken in unison.